Would it be possible to eject the Holy See from the international organizations? This not such a new idea. In 2007, The Economist - English weekly which is widely read in government foreign offices – ended an article about the Vatican diplomacy with this advice for the Holy See: «It could renounce its special diplomatic status and call itself what it is – the biggest non-governmental organization in the world». On a par with Oxfam or Doctors without Borders. The idea of expelling the Holy See from the concert of nations is not new. Since 1995, “Catholics for a Free Choice” has tried to do this through petitions signed by various countries. The American group is led by a former religious sister, Frances Kissling – who has been officially excommunicated by the bishops of the United States. The campaign was called «See Change». and it was aimed at expelling the Holy See from the United Nations. Because – they said – the Catholic Church is the only religion in the world that sits at the UN as a permanent observer, with “privileges” similar to those of sovereign nations. In the bureaucracies of the UN and of the other major international organization that is the European Union, in which the Holy See has the rank of observer, the desire to expel it is fairly widespread, and sometimes it comes to light. The reasons in support of this expelling Holy See from the concert of nations seems to be paradoxical. If the Church strives to bring peace in the world, that’s unobjectionable, but when it opposes abortion and euthanasia, no. «It is not right – said they who protest against the Holy See international status – that in order to support its own interests it should make use of an international juridical status that doesn’t truly belong to it». Even if the Church claims for religious freedom, world governments don’t seem to appreciate it. 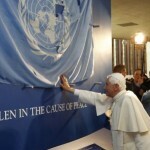 The last Benedict XVI’s message for the World Day of Peace was precisely about religious freedom. Nowadays, religious freedom is a crucial challenge, and this was even more evident by analyzing the international reactions to the Message. The Pope underlined that «the same determination that condemns every form of fanaticism and religious fundamentalism must also oppose every form of hostility to religion that would restrict the public role of believers in civil and political life». Benedict XVI so outlined two risks for religious freedoms: the attacks coming from fundamentalism and the attacks coming from the secularism. No-one of the world governments underlined the attack coming from the secularism, but every-one declared to be on the Pope’s side in defending religious freedom from fundamentalisms. All right, but what about secularism? As Benedict XVI stated in the traditional speech held at the beginning of the year to the Ambassadors accredited to the Holy See, there are «Countries which accord great importance to pluralism and tolerance, but where religion is increasingly being marginalized. There is a tendency to consider religion, all religion, as something insignificant, alien or even destabilizing to modern society, and to attempt by different means to prevent it from having any influence on the life of society». The Pope also condemned the fact that «Christians are even required at times to act in the exercise of their profession with no reference to their religious and moral convictions, and even in opposition to them, as for example where laws are enforced limiting the right to conscientious objection on the part of health care or legal professionals». These words remained unheard. While – on the other hand – governments’ foreign offices claim themselves as promoters of religious freedom. Recently, Mr. Franco Frattini, Foreign Affairs minister of Italy, met card. Tarcisio Bertone, Vatican Secretary of State. They officialy talked about “Arab spring” and European Union issues. But it also was the occasion for Mr. Frattini to underline Italian efforts in favor of religious freedom. Mr. Frattini has certainly remembered the efforts of Italy to keep the crucifix exposed in Italian classrooms and his personal battle against the absence of the Christmas holidays in the calendar of the European Parliament. Anyway, when the aim to eject the Holy See from the concert of nations comes down to action, it never succeeds. 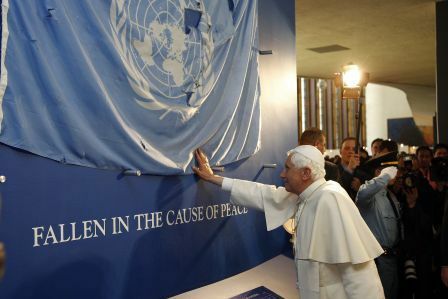 In July of 2004, the UN general assembly approved a resolution that not only confirmed, but even reinforced the Holy See’s presence in the organization. The Holy See has been at the UN since April 6, 1964 with «permanent observer status». Since the Holy See’s ejection is far away to come, there is a more subtle strategy, in order to undermine the moral power of the Church and of religions in general. It is brought on by considering religious freedom as one of the freedom of expressions, or by considering religions no more than a tradition. One example – according to many observers – is precisely the crucifix verdict. According to this verdict, crucifix is just a tradition and the Great Chamber does not pronounce about the traditions of the countries. So, the problem is only postponed to when the tradition will change. Another strategy is to weaken the Social Doctrine of the Church. The Compendium of the Social Doctrine of the Church is very fair: the Church has an evangelical vocation to take care of social issues. This social-evangelical vocation has an even important meaning nowadays. Fifty years ago, Pope John XXIII defined the world imbalances in the encyclical Mater et Magistra. Now, these imbalances need to be updated with new ones, as an international congress pointed out. But in Ubicumque et semper – the Motu Proprio which promulgates the new Vatican Pontifical Council for the Promotion of the New Evangelization – the Social Doctrine of the Church is never mentioned. On the other hand, some of the Justice and Peace Commissions in the world are thinking to change their name from Justice and Peace to Caritas in Veritate. Caritas in Veritate is an encyclical considered by many Vatican insiders a “little miracle”, since many put their hands on the text. Ettore Gotti Tedeschi – now president of the I.O.R. (Institute for Religious Works), Giulio Tremonti – minister of Economy and accredited by many as the next Italian premier, Mario Draghi – governor of Bank of Italy and now running for the presidency of European Central Bank, had the opportunity to make their observations to the text of the encyclical. And the Italian bank world took possession of the topics of the encyclical taking part to a Congress about Caritas in veritate and organized by the Pontifical Council for Laity. No member of Pontifical Council for Justice and Peace – who had in charge the writing of the encyclical – had been invited. Even Vatican diplomacy can be undermined. Rumors from diplomatic environments said that there is the intention to let some lay take important charges in Vatican Diplomatic Corps. Pontifical Legates must be priests, because they represent the Pope. This rule is valid only for Papal nuncios. Papal nuncios are the Pope’s ambassador, but at the same time they work as bishops. They weigh up candidates for episcopate in the countries in which they are nuncios, they speak to Episcopal conferences, and they also have relationships with governments. On the other hand, nuncios who are appointed as permanent observer (at United Nations, Unesco, Fao, European Parliament) just have in charge to maintain relationships among Holy See and States. Appointing lay people as permanent observers would not be out of Canonical Law. Would this be a defeat for the Holy See diplomatic tradition? 3 Responses to Undermining Holy See diplomacy. An impossible mission? If Muslim states are given the chance to form their own organization (i.e. the Conference of Muslim States), why shouldn’t we Catholics have representatives speaking for us worldwide ! Does the Conference of Muslim States have status at the UN? Has The Rock been negligent, breached its duty of care or committed crimes against god? then tell us your truthful stories of abuse and neglect and your views. At C.1:Q.96, Nostradamus foretells of an iconoclastic prophet, using refined language to continually educate, who is raised in the Last Days.